One of my favourite deals, they had this last year. 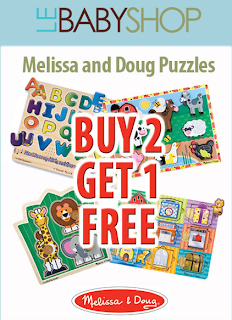 Buy 2 Melissa and Doug puzzles and receive a 3rd puzzle FREE. These puzzles make great gifts! The third item will automatically be discounted once it is added to your cart. Puzzles do not have to be identical to qualify for the discount. The discount applies to the item with the lowest value. May not be combined with coupons or other promotions. Available online only for a limited time or while quantities last. See their website for complete details. They've also got 50% off all Fuel clearance items including lunch containers, lunch bags and bottles. Visit Le Baby Shop at www.lebabyshop.com. 0 Response to "Le Baby Shop - Buy 2 Get 1 FREE Melissa & Doug Puzzles"